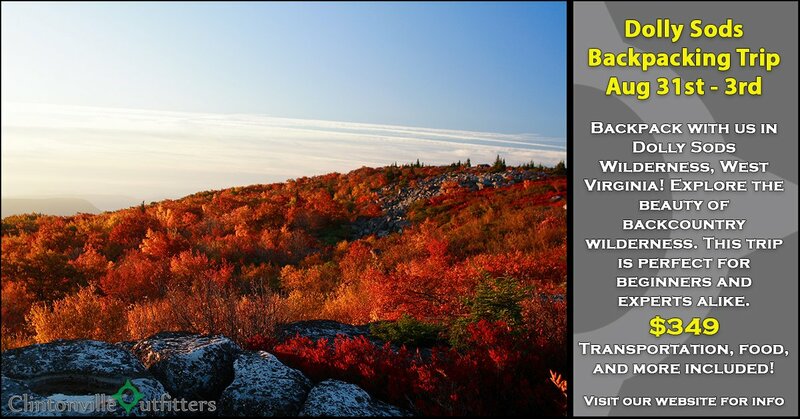 Backpack with us in Dolly Sods Wilderness, West Virginia! Explore the beauty of backcountry wilderness while bonding with other like-minded hikers. Learn Leave No Trace and other backpacking skills while appreciating natures wonders. This trip is perfect for beginners and experts alike. Friday, August 31: Meet at Clintonville Outfitters at 6:00 a.m. Distribute group gear and drive 5 hours to Dolly Sods Wilderness in West Virginia. Eat lunch then hike 3-5 miles to our first campsite to cook dinner. Watch the stars and relax in complete wilderness. Saturday, September 1: Wake up and cook breakfast. Pack up camp and hike 4-6 miles stopping for breaks and lunch. Learn how to filter water and dispose of waste properly. Once we reach our first campsite, we will cook dinner. Sunday, September 2: Wake up and cook breakfast. Pack up camp and hike 4-6 miles stopping for breaks and lunch. Once we reach our last campsite, we will cook dinner and enjoy a backcountry dessert under the stars. Monday, September 3: Wake up and cook breakfast. Pack up camp and hike 3-5 miles back to the van stopping for breaks. We will eat lunch and drive 5 hours back to Columbus. Head home for a much deserved shower! Don't have the gear? We have you covered! Activity Level: Must be able to hike 3-7 miles of moderate to strenuous trails while carrying a 40 pound backpack. Hiking Poles are strongly recommended.